With only three weeks left before the Kentucky Derby, this weekend is a crucial one for horses expecting to start in the Kentucky Derby. The timing is optimal for a final prep so they enter the Derby in top form, but the rich purses also give them a chance to add to those much-needed graded stakes earnings so they draw into the Kentucky Derby field. This weekend up for grabs were the Toyota Blue Grass Stakes at Keeneland and the Arkansas Derby at Oaklawn. Bandini winner of the Toyota Blue Grass Stakes. The Grade 1 Toyota Blue Grass Stakes at Keeneland has been the traditional final prep for the Derby, being held in the same state and under similar weather conditions as the main event. A field of seven went to post in this $750,000 stakes race over 1 1/8 miles. Sent off as the 5-2 favorite was the undefeated High Limit, off his 4-length win in the Louisiana Derby. Two colts were tied as the 3-1 second choices, San Felipe Stakes winner Consolidator and Fountain of Youth Stakes runner-up Bandini. 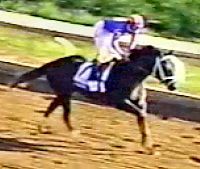 When the gate opened, jockey Gary Stevens hustled 25-1 shot Spanish Chestnut to the front, and he got the half in 46.65 and 3/4 in a brisk 1:10.56, while Ramon Dominguez kept the favorite in a stalking position a length and a half back. John Velazquez took the 4-wide path to stay out of trouble, laying in third position for the backstretch run. Turning for home, Spanish Chestnut showed no response when asked and quickly dropped out of contention, finishing sixth. Bandini was put to a drive midway around the turn, passing High Limit at the 1/4 pole, and drew away through the lane to win by 6 lengths over the favorite in a time of 1:50.16. It was another 3 lengths back to 12-1 shot Closing Argument, with 7-2 fourth choice Sun King fourth and Consolidator fifth. Winning rider John Velazquez said, "We broke well and were very comfortable after that. He ran much better today than he did in the Fountain of Youth. He learns from every race and this experience will teach him even more. He is much more focused now. I was more aggressive with him today. I asked him to picked it up more from the half-mile pole today and after that, he went right on." Winning trainer Todd Pletcher said, "I was quietly confident today. He had two really good breezes here, so I was only concerned about our post and his focus. He has a tendency to be ultra-competitive. It couldn't have gone any better." Ramon Dominguez, aboard beaten favorite and second place finisher High Limit, said, "He ran a strong race. He had no problem running from behind. He seemed to handle passing (Spanish Chestnut). He ran strong down the lane. He is still very young but this was good learning experience for him." 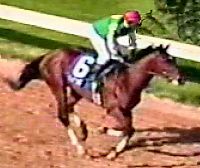 Afleet Alex winner of the Arkansas Derby. At Oaklawn Park, ten 3-year-olds went to the gate in the Grade 2 Arkansas Derby, a 1 1/8 mile test for a $1 million purse. Although it hasn't been the ideal prep historically, last year it was successfully used by dual classic winner Smarty Jones. Despite his poor showing in the Rebel Stakes last time out due to illness, Afleet Alex was sent off as the 2.40-1 favorite over 5-2 second choice Greater Good, winner of the Rebel. Also in the field was 4-1 third choice Flower Alley, winner of the Lane's End Stakes, and Lane's End runner-up Wild Desert at 7-1. 44-1 longshot Batson Challenge was clear to the front early through a quarter in 23.03 and a half in 47.91, with 11-1 shot Canteen close behind and Flower Alley in a stalking position in third. Entering the far turn, Batson Challenge dropped out of contention, as Canteen inherited the lead after 3/4 in 1:12.78. Afleet Alex, fifth early, ranged up at will under Jeremy Rose to challenge for the lead on the turn. With a 1/4 mile to go, the favorite surged to the front and quickly drew away, to win by 8 lengths in 1:48.80 over Flower Alley. 10-1 shot Andromeda's Hero inherited the show spot just 3/4 length back, while Greater Good disappointed in fifth and Wild Desert was eighth. Winning rider Jeremy Rose said, "This was the first time in a major race that I got a clean trip aboard (Afleet Alex). He settled in nicely and I moved him up easily around the final turn. The crowd was roaring so loud and I didn't know if that meant that (Greater Good) was making a big move at us or not." Winning trainer Tim Ritchey said, "He ran the race I knew he could run. I don't want to sound like I am blowing my own horn, but in the back of my mind I started thinking about the Kentucky Derby when he won the Sanford, then the Hopeful." Todd Pletcher, trainer of second place finisher Flower Alley, said, "He's an improving horse and he'll get a mile-and-a-quarter, so I think we'll give it a try." Greater Good's trainer Bob Holthus is also sending his colt to the Derby, saying "He has done a lot in his career so far and we'll get another chance."